When I tell people I paint furniture they think I paint flowers and beautiful artsy details on furniture. No……I can’t even draw a stick figure! 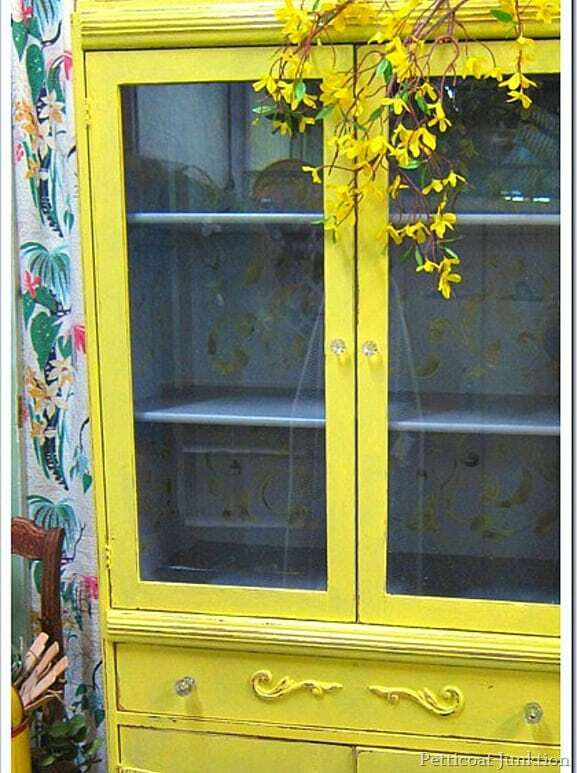 When I say I paint furniture, that means I slap a little paint on with a roller or a large paint brush. 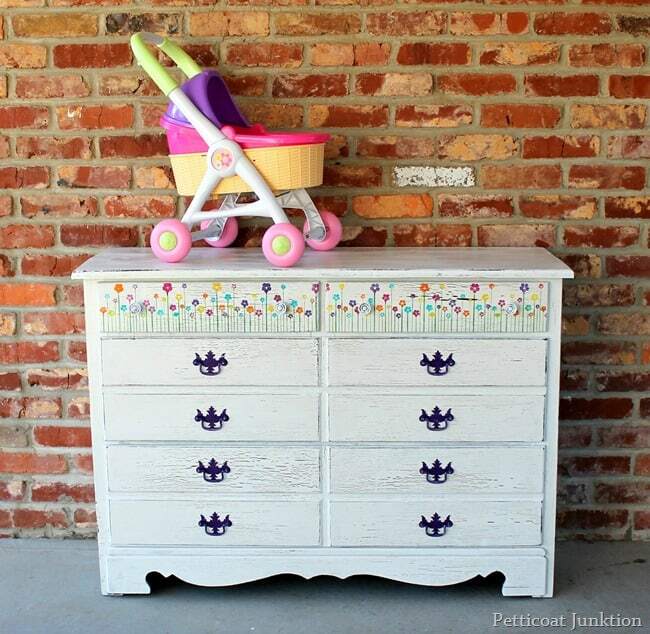 If I want to put a design on the furniture I have to use a stencil or something similar. 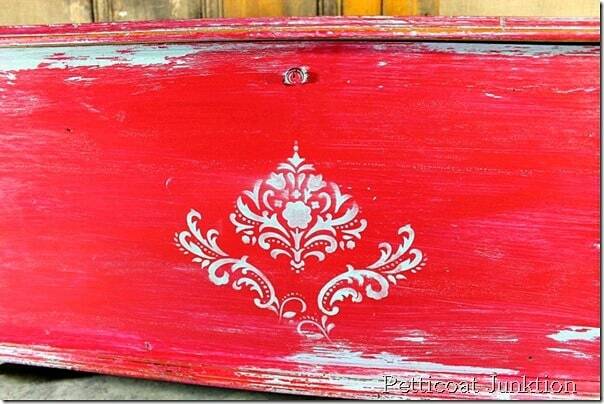 Stenciling is a simple way to add detail to any piece of furniture or to home décor accessories. 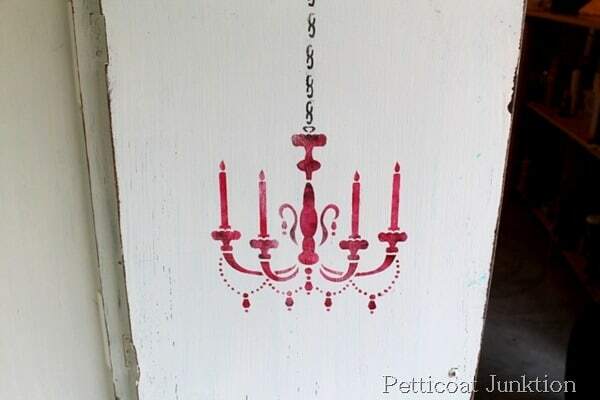 I gathered my favorite furniture stencil projects here for easy reference. 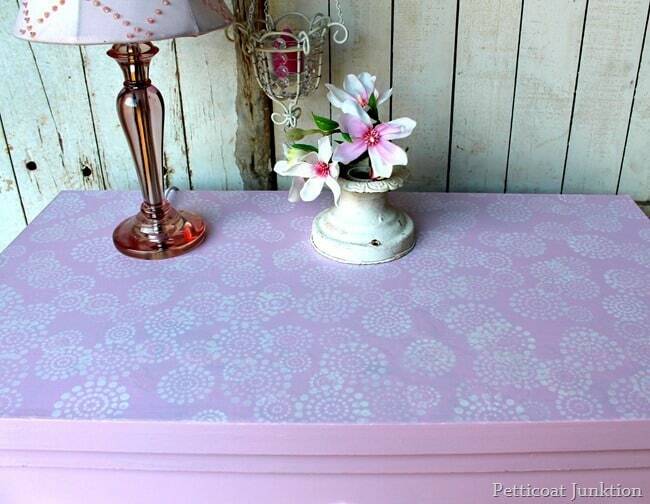 Click any photo or “pink link” for more photos and the full stencil tutorial. Are you one of those talented people who can really paint…like freehand floral designs on furniture or paint a real picture on canvas? I have a mental block about stencils. I tried to stencil a clay pot last summer and it looked like a black messy blob. There must be a trick to it and I can’t seem to figure it out. I might try wood next time. If I can find the stencil. It was a cute little bird stencil I found at Walmart. You make me feel better about my painting, I thought anyone could paint freehand, but I depend on the stencils. 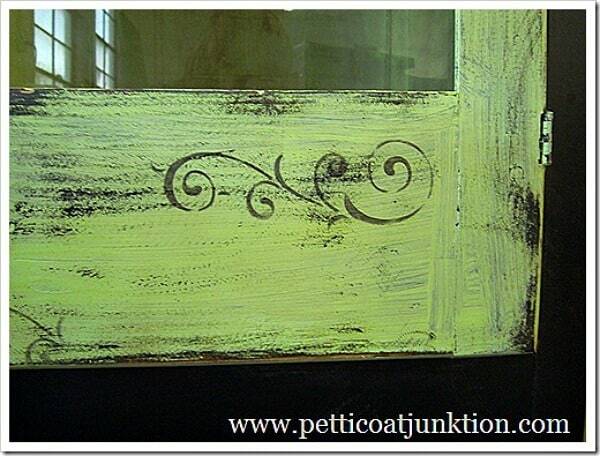 I’m in love with your green stenciled wardrobe! I can freehand simple designs fairly well, but I’m hopeless with letters. Love your blog! Read every post. I paint my on patterns on my pieces HOWEVER – for those who want a different look – check the following DOLLAR store frequently will have some outcast rub on designs that actually look good! 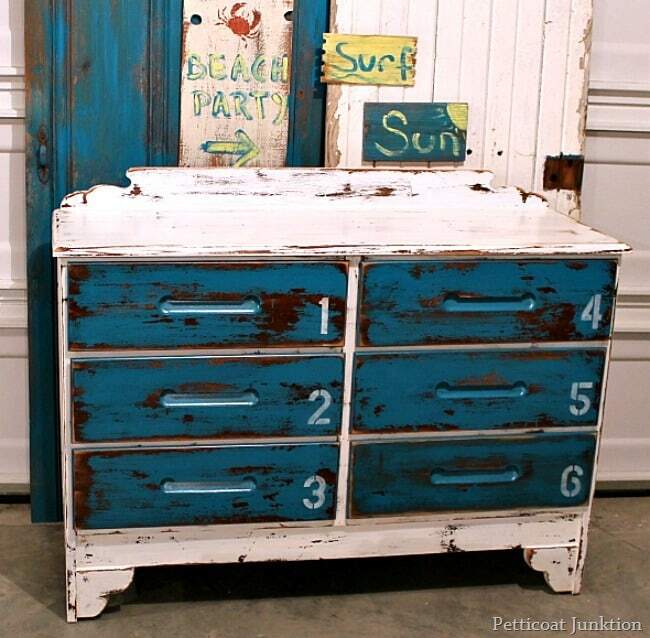 You place them on you piece, rub it on, then use a nice wax or semi gloss coating – looks wonderful! I cried in frustration when trying to free hand a design on furniture and have found that stenciling is the best for good results. Learning to make my own stencils without having uneven edges on the curves was the challenge that I’ve moved to now. However, practice helps and not picking a sketch that is too complicated. 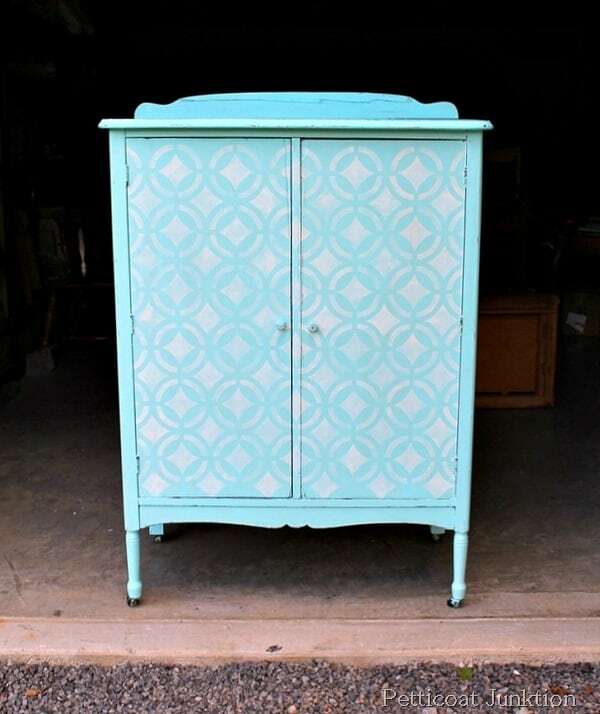 I don’t think I would take on the large turquoise armoire like you, but I enjoy the process. Have a great day, Kathy.